We all love our hair. We love to curl it and straighten it and braid it and wear it up for a night out with the girls. But sometimes trying to make it look good and keeping it from getting damaged seems like a never-ending battle. So what do you do when you feel the ends of your hair start to split? You've worked hard to get your hair to the length that it is and if you're like me, you want your hair to continue growing. Here's what you can do to avoid a haircut but save your hair from getting damaged. When you wrap your hair in a towel after you shower, the rough fibers tug at your hair and can encourage more breakage. Switch to a smooth microfiber towel so you don't lose healthy hair to rough towel fibers. I know we said no haircuts, but a trim might be your only option. Trimming off the bottom inch or so can help your hair from splitting at the bottom (and further up the shaft). If you need a fresh start, get a trim and follow the rest of these tips to keep your hair as healthy as possible. We love curled locks and straight hair, but sometimes you hair just needs a break. Embrace your natural hair and give your strands a break from the heat. Think about showering an hour or two before bed so you hair has time to dry naturally (and you can skip out on blow drying all together). When you sleep, you often roll over your hair, or your sweetheart ends up on it or your pillowcase fibers pulls at your hair — all three of these situations encourage breakage. Putting it in a loose updo at night keeps your hair together and prevents your hair from breaking or or further damage while you snooze. Using heat protecting serums for your hair allows you to do whatever hairstyle you want without as much damage. Additionally, a lot of serums are also chock full of nutrients that can help boost your hair's health. There are a ton of homemade masks you can make for your hair ( here are a few examples) that will help moisturize your locks. And when your hair is moisturized, it won't break as easily. After a couple of hair masks, your strands will be stronger and healthier than ever. Don’t be afraid to use dry shampoo for the days in between washes. 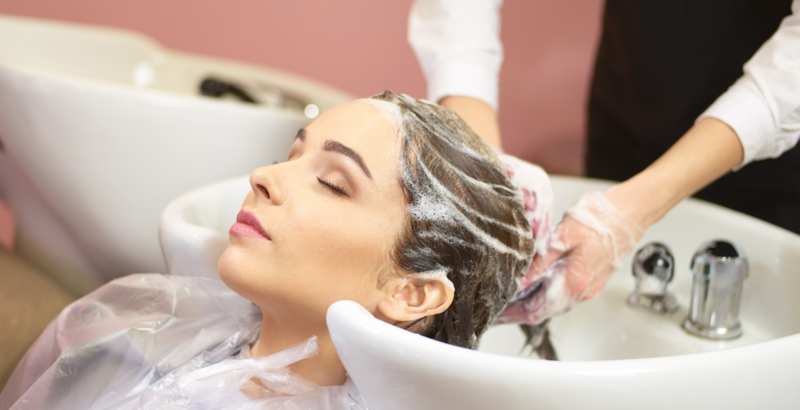 Shampooing strips your hair of nutrients, so think about letting your natural oils condition your hair instead of replenishing with synthetic conditioners. For healthy hair, make sure that you are eating healthier. According to WebMD, foods high in healthy fats (like salmon) and full of protein (like Greek yogurt) can help encourage better growth. No matter the length, your hair is beautiful ... but you can follow these tips to get healthy hair without reaching for the scissors.